Chelsie Hightower performs during the Dancing Pros Live performance Wednesday night at the Orpheum Theatre in Sioux City. SIOUX CITY | Full disclosure: I quit voting for contestants on reality shows because the people I chose never won. So, it was with some delight that I watched the couple I voted for come out victorious as they battled Wednesday with five other couples on the Orpheum Theatre stage for "Dancing Pros: Live!" When ABC broadcasts its hit reality show, “Dancing with the Stars,” the "stars" are celebrity contestants, several of whom have no dance chops. But this national tour truly highlights the “stars” – those incredibly talented professional dancers who show off their own style and athleticism in this live dancing competition. The show was hosted by "DWTS" veteran Edyta Sliwinska and Alan Thicke, star of the television show “Growing Pains,” and -- for you younger readers – the father of singer Robin Thicke. 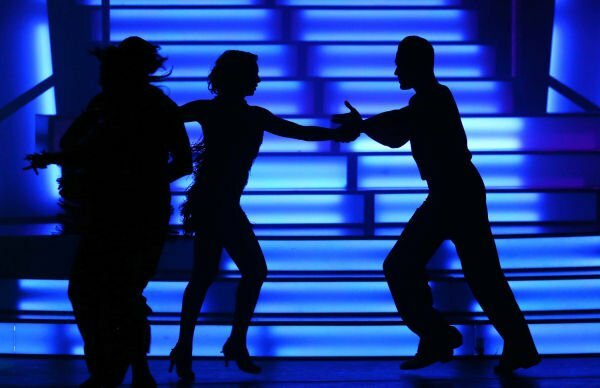 Professional dancers from "DWTS,” "So You Think You Can Dance" and dance champions from around the world competed with one another in a variety of dance styles, including cha-cha, waltz, tango, swing and jitterbug, to name a few. The evening was a mix of breathtaking dance, fun backstage stories and some impressive vocals from Holly Tucker, a finalist on "The Voice." Although the outcome is determined by the folks in the seats, three judges provided insights. "DWTS" pro Karina Smirnoff and choreographer Oscar Orosco were the national touring judges. Each competition also invites a local judge to assist, and that honor went to KTIV-TV news anchor Matt Breen. The couples who competed were: Paul Barris and Regina Maziarz; Tal Livshits and Ilana Keselman; Benji Schwimmer and Tori Smith; Dmitry Demidov and Anastasia Trutneva; and Chelsie Hightower and Artur Adamski. Working with a set that looked like something right out of Studio 54, the dancers held nothing back as they kicked and gyrated and mugged for the crowd, hoping to garner enough attention to get those votes at the end of the show. Clearly, no expense was spared on the costumes for the women, who changed before each time they came out on stage, sporting outfits featuring more sequins, chiffon, tulle and feathers than any craft store would carry. The budget for the men must have been sparse, as it looked as if they wore the same black pants for practically every dance number. The production was interspersed with ensemble numbers that even featured Smirnoff, Orosco and Sliwinska. An African dance number was the most creative. It seemed that seven-season “DWTS” veteran Hightower and Adamski – who bore an uncanny resemblance to actor Ryan Gosling – were the audience favorites, drawing hoots and spontaneous applause during their performances. At the end of the singing and dancing fest, the audience members picked their favorite couple, voting with electronic remotes that were attached to each seat. It was the very youthful Schwimmer (Season 2 “So You Think You Can Dance" champion) and Smith (10-time West Coast Swing world champion) who totaled the most votes – including mine. Dmitry Chaplin never thought of dance as a stepping-stone to anything. Simon Estes has performed with 115 orchestras, such as the New York Philharmonic, and under the baton of 90 maestros, such as Leonard Bernstein. There was room in the Sioux City Symphony Orchestra’s Christmas Spectacular on Saturday night for Santa, Rudolph, Frosty, The Grinch and Frank Sinatra’s best.